MONTREAL -- Quebecor Inc.'s (QBRb.TO) chief financial officer has been appointed to head the company's Videotron business after the departure of its previous CEO. The appointment of Jean-Francois Pruneau to president and CEO of Videotron, which is mostly active in Quebec, fills a vacancy left by outgoing CEO Manon Brouillette. Brouillette headed Videotron for five years during a period of rapid growth as it solidified its position as a major regional competitor to Canada's national wireless carriers. Pierre Karl Peladeau, chief executive of Quebecor as well as its leading shareholder, announced Pruneau's appointment Monday before stock markets opened. 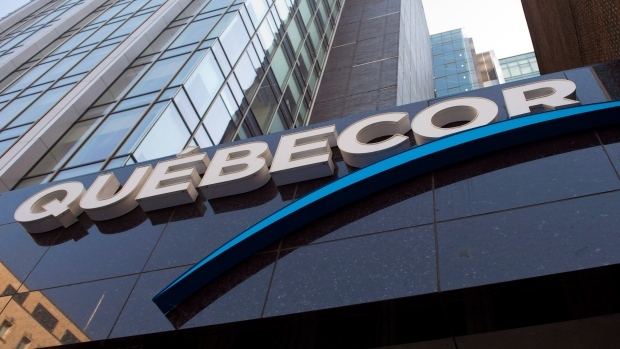 He also announced that Quebecor's new chief financial officer is Hugues Simard, who had been with the company from 1998 to 2017, and that Marc Tremblay has been promoted to Quebecor's chief operating officer. "Over the past two decades, we believe Mr. Pruneau has established strong credibility with investors and has been an important piece of the Videotron growth story over this period," McReynolds wrote in a research note. Barclays analyst Phillip Huang had a similar positive view of the appointment. "While the promotion of CFOs to the CEO role is rare in the industry, Mr. Pruneau has been very hands-on in every key aspect of QBR's operations," Huang wrote.